Pageviews: 582 Vancouver, B.C. - Vancouver Canucks Senior Vice-President and General Manager Dave Nonis announced today that the Canucks have re-signed forward Trevor Linden to a new contract. In keeping with club policy, terms of the deal were not disclosed. Linden, 37, is entering his 19th NHL season (16th with Vancouver) and holds the title for franchise records in a number of categories. Linden is the all-time franchise leader in games played (1081) and points (721), as well as the team�s franchise leader in playoff games played (118), playoff goals (34), playoff assists (61), and playoff points (95). 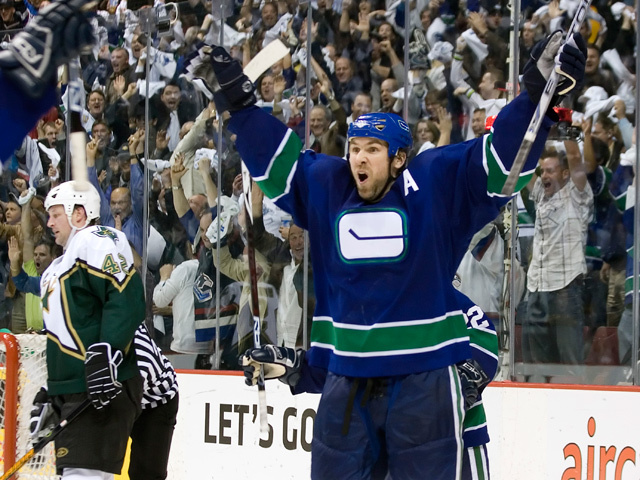 On April 23, 2007 in Game 7 of the Western Conference Quarter-Final series against the Dallas Stars, Linden notched his 34th career playoff goal as a Canuck, tying Pavel Bure for the all-time franchise lead. Last season, the 6�4�, 220 lbs. winger appeared in 80 games with the Canucks, recording 25 points (12-13-25) and 34 penalty minutes including a game-winning marker in the season opener. He also appeared in all 12 playoff games with Vancouver, tying for the team lead in scoring with seven points (2-5-7). Linden notched two game-winning goals in the post-season, including the winning marker in Game 7 against the Dallas Stars. Over his NHL career, which includes tenure with the New York Islanders, the Washington Capitals, and the Montreal Canadiens in addition to Vancouver, Linden has played in 1323 career games recording 855 points (368-487-855) and 880 penalty minutes. He has also appeared in 124 career NHL playoff games, registering 99 points (34-65-99) and 104 penalty minutes. In addition to his work on the ice, Linden has had an equally large impact in the community off the ice. In 2003, Linden was appointed to the Order of British Columbia in recognition for service with the greatest distinction and excellence in a field of endeavour benefiting the people of the Province. Linden is also a recipient of the King Clancy Memorial Trophy, awarded to the player who best exemplifies leadership qualities on and off the ice and has made a noteworthy humanitarian contribution in his community. The Medicine Hat, Alberta-native was originally drafted by the Vancouver Canucks second overall in the 1988 NHL Entry Draft. In 1998, Linden was traded to the New York Islanders in exchange for Todd Bertuzzi, Bryan McCabe and a third round draft pick (Jarkko Ruutu); in 2001 the Canucks re-acquired Linden along with a second round pick in 2002 from the Washington Capitals for a first round pick in the 2002 draft and a third round pick in the 2003 draft.